BerryPro is a clean, modern and fully responsive multipurpose Drupal theme suitable for company, business, corporate, and portfolio and personal websites. BerryPro is not dependent on any core theme or any third party module. You do not need to install any non-core module. This make it light weight, easy to use and faster. All the features of theme are inbuilt. We can install theme on your domain name for free. We will also make your website ready just like the demo with demo content. Just let us know and we will do for you. *Free installation is limited to one per purchase. BerryPro theme is designed to adapt quickly on all devices and screen resolutions to provide users an optimal viewing experience. BerryPro theme is tested in all modern browsers. Its compatible across Firefox, Safari, Chrome, Microsoft Edge and Internet Explorer. You can easily change color of the theme using color picker. Pick from unlimited color options with the click of a button. BerryPro themes are designed to make them easier to use without the headaches of dealing with themes that have a million functions that can often be confusing and hard to learn. FontAwesome icons included. Font Awesome gives you 600+ scalable vector icons that can be easily customized — size, color. You can use these icons on your website. Every site requires something different. That's why we offer tons of custom shortcodes so that you can easily add custom buttons, tabbed content, carousels and more. Express yourself with our clean and modern responsive designs that are beautifully crafted to look good on devices of all sizes. BerryPro theme is coded clean and simple. You can esily understand and edit the code for modification. 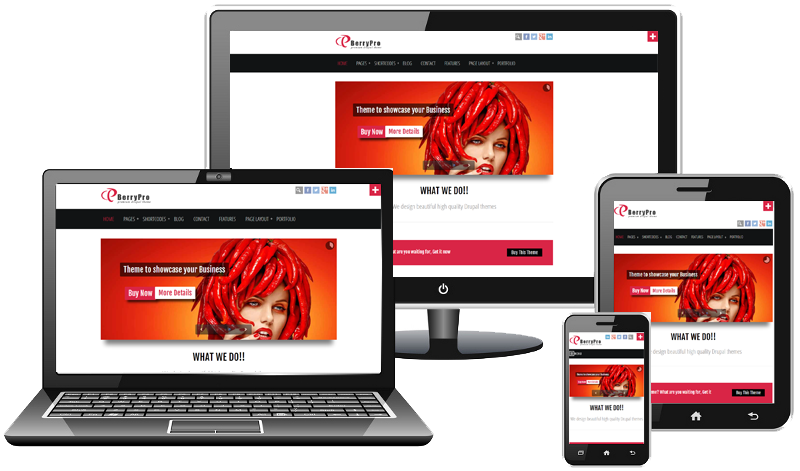 BerryPro theme is fast loading, SEO friendly Drupal theme. Do you want your website to look like the theme demo? Well our demo content is included with your theme download. We have complete step by step theme documentation and our friendly support staff is always ready to help you. You will be entitled to download all updates for free once you purchased the theme. Theme Options Panel allows you easy customizing of the website..
BerryPro theme comes with a very neat and modern slider powered by jQuery and CSS3. You can showcase your work, services, clients etc, using cool filterable feature. You can create cool pages like About, Services, Portfolio, Team, FAQ, Pricing table, Error pages, Maintenance page etc. 100% Fully Responsive Theme: With a responsive design it is easily usable with any device (desktop, tablet, mobile phone). Header sliding panel. Option to show / hide this panel.